The plight of the honeybee prompted me to explore images inspired by the Hive. The bees are quite literally in the paintings as I mix cold wax (beeswax) into my oil paint. I apply the mixture in many thin textural layers, shaping, adding, and removing paint to reveal the image. 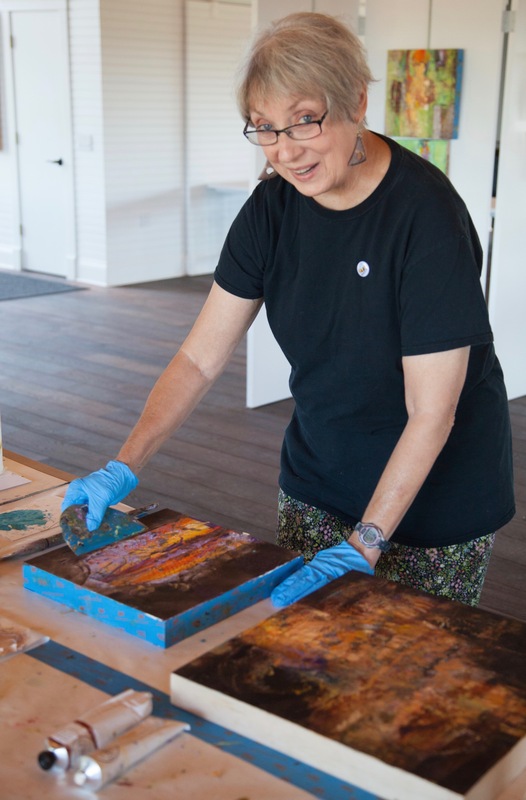 I use printmaking tools as squeegees and brayers to construct rich and luminous abstract compositions on cradled wood panels. In these paintings I imagine and long for the hum of a sacred regard for the Earth. Though my paintings are abstract, they exude my interest in mythology, science, spirituality and the environment. In 2007, after 35 years of teaching art and developing arts integrated programming, I opened a studio in Sylva NC. Prompted by my interest in merging subject with media, I studied cold wax paintings with master painters, Lisa Pressman and Rebecca Crowell at Cullowhee Mountain Arts at Western Carolina University. The series of over 100 paintings has led me to solo exhibitions entitled “Pollination” I am available for artist residencies and presentations that focus on an arts integrated approach to creative works. Many of the paintings are in the private collections of art lovers in the South, Ohio and New York. I have been artist in residence in Berkley County, SC (2016)< and three summers at the Island Lavender Festival on Washington Island, WI (2016,17,18) My paintings can be seen at Charles Street Gallery, Beaufort, SC, Stecoah Art Center, Stecoah, NC, Haywood County Arts Council Gallery, Waynesville, NC and Jackson County Arts Council, Sylva, NC. I teach in the Summer Arts Workshop Series at WCU in Cullowhee, NC. I also facilitate individual and small group workshops.